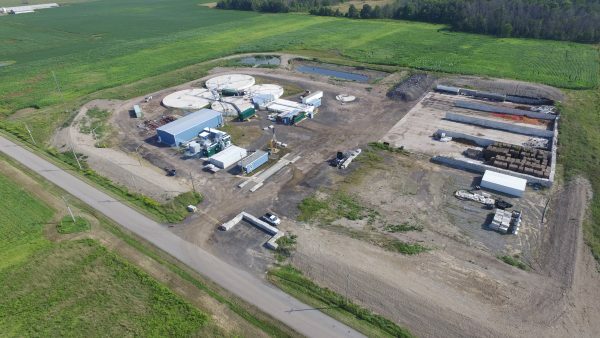 With $15 million in liabilities and the need for an immediate $300,000 from the Town of Grimsby to stay afloat, the biodigester project is on life support. The stark reality of financial doom lay over Grimsby’s council chamber like a blanket Monday night as a long-awaited status report regarding Grimsby Energy’s biodigester project was rolled out by new GEI chair Delight Davoli. It was not pretty. It was downright ugly, in fact. Behind the sweeping results of the Oct. 22 election, the newly installed council set about fulfilling its election promise of getting to the bottom of biodigester woes. A new board – with Davoli as chairperson, with Jim Howden. Rob Hattin and Coun. Lianne Vardy – set about their research immediately after being put in place by the new Grimsby Council. Council acts on behalf of the shareholder of the utility. The new board members did not need to dig deep before they found the need for action was crucial and immediate. Simply, all financial avenues have been exhausted and another infusion of more than $300,000 is needed over the next few months just to keep the Sobie Road site operational. Davoli noted $100,000 would be needed for every month the facility continues to operate after March. “Council needs to understand, money is essential for every option we have, even if we look to sell, lease or decommission,” said Davoli. The problems which the biodigester and its operating company GEI have experienced arose virtually at the outset and got larger and more expensive as years progressed. The woes started with the ill-fated CoGen unit installation in 2010. That unit sat unused for five years and has only been used two months of the year when it finally was fired up. There have been several expensive repairs and it was “sold” by GEI to the Town for $800,000 to get it off the company’s books at a loss of $400,000. Over 2010 and 2011, GEI operated at a loss of over $1 million necessitating borrowing from its parent company, Niagara Power Inc., and Grimsby Power Inc. to pay for those losses. From there, the company moved onto the biodigester in 2012. By 2014, before construction of the actual plant had started, GEI had already amassed a debit of $1.8 million. Over the next two years, the construction costs skyrocketed from what was initially a budget of $3.5 million and reset early on to $4.5 million to come in at around $8.6 million. In 2016, hydro officials made the decision to sell its 25 per cent stake in Niagara Regional Broadband Network (NRBN) and use the proceeds from that $9 million sale to float the biodigester project. • the original $4.5 million bank loan, which was cosigned by Town of Grimsby after an emergency meeting of council in 2015. The issues with the company go far beyond unexpected cost overruns and into bad day to day operations decisions and poor business practices, said Davoli. In her report, as two examples, she cited a transport truck cab which was purchased in 2018 but never used. On the administration end it was noted no minutes from board of directors’ meeting pre-2017 have been located as yet. As well, the company’s financials have been in complete disarray. A new accountant was hired in May 2018. The first task was to redo the books from January to May of 2018 to get them in order. “There were duplicate payments made, incorrect transactions and problems that were addressed by starting over rather than making corrections,” Davoli noted in her report. As the auditor worked through the financials, $5 million in adjustments were necessitated after the attempted corrections were made. “The records are in disarray. We are not even sure if we have everything as we only know what we have found,” Davoli said. • the two leachate ponds on-site fill regularly necessitating pumping onto the site’s open fields, even in the winter, which is not compliant with provincial guidelines not allowing pumping onto fields in fall/winter. One of the key facets which has been virtually ignored, noted Davoli, has to do with a decommissioning plan for the site. “As part of the approval process, the MoECC dictates that a decommissioning plan be put in place as part of the overall plan. There is no evidence that this was done, given that no plans were done to begin with,” said Davoli in her report, noting Monday that a 2012 plan on the utility’s website is obsolete and reflects a long-outdated design. Regarding the financial dealings among Grimsby Energy and the municipality’s other hydro-related companies the outlook is bleak at best. “Between 2011 and 2018, GEI and its related companies transferred significant monies between them,” noted Davoli. As for Grimsby Hydro and the NRBN proceeds, “It is unlikely that GHI will be able to collect the $7.1 million owed by GEI or all of the $260,000 from Holdco2,” said Davoli. The bank holding the $4.5 million loan, which has been very cooperative it was noted, has requested principal payments begin soon. Interest only payments have been made to date. GEI’s cashflow cannot carry these payments. The Town’s guarantee on the loan could be called unless other arrangements are made. As this is just the initial status report, with a follow up scheduled for early February, some immediate actions are still required. Even if a sale were to be negotiated, as one example, due diligence would still need to conducted as well as other prudent measures taken in a major acquisition. This necessitates an immediate cash infusion of $150,000 in January with at last that much again required into March to keep things operational. In her summation, Davoli lamented the money wasted on the biodigester which could have gone to pay for other other Town projects. “That is $9.7 million which should have gone to the Town,” said Davoli of the funds shifted among hydro’s companies to GEI.